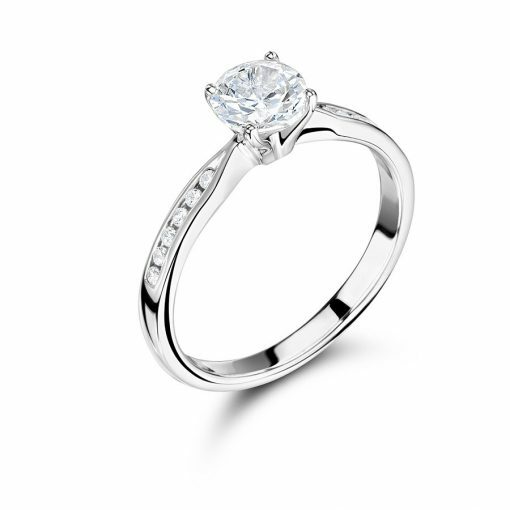 This timeless classic has been given a modern slant with its channel set diamond shoulders. The round brilliant cut centre stone stands proudly in its four claw setting. Voltaire Diamonds have a wide range of exquisite diamonds that can be set into the ring of your dreams. Come and share your dreams with us. Our beautiful offices are situated in Dublin 2, just off Grafton Street. Call us today to arrange your consultation as we see our clients by appointment only.